Grab these healthy, low-carb nut butter balls for a quick breakfast or anytime you’re on the run for a protein punch and plenty of healthy fats to support your ketogenic diet. Spoiler alert: there’s no peanut butter in these low-carb nut butter protein balls. And still, they’re the most delicious sugar-free, dairy-free, keto snacks you’ll make all year. Many of the low-carb, keto protein balls you’ll see on the Internet are peanut butter based. And while peanut butter is delicious, creamy, savory and a bit sweet, it also comes with some nutritional risks. Peanuts and peanut butter may cause inflammation and may cause some digestive upset. So, while peanut butter is technically keto, adding it to your healthy treats isn’t worth the risks. Instead, try creamy almond butter, macadamia nut butter, or Perfect Keto Nut Butter, which is a sugar-free mixture of macadamia nuts, vanilla, and brain-boosting MCT oil. Protein helps support muscle building and maintenance, recovery, and weight loss[*][*]. And although the keto diet isn’t necessarily considered a high-protein diet, it’s important to get enough protein to support your workouts and lifestyle. Whey protein is one of the most bioavailable sources of protein out there, which means your body absorbs it quickly and uses it to rebuild muscles and other tissues. Whey protein may improve exercise performance, body composition, and recovery[*][*]. Not an athlete? Protein also helps produce neurotransmitters and hormones — both essential to mental performance. Healthy fats from Perfect Keto Nut Butter will also help support an active lifestyle. With plenty of monounsaturated, saturated fats and MCTs (medium chain triglycerides), your body will always have enough fuel to get through tough workouts. You don’t just need protein to build muscle or improve recovery post-gym. Protein plays a critical role in neurotransmitter production and brain development. Neurotransmitters send crucial communication signals between brain cells and between your brain and body. They also help regulate your mood and help with memory and learning. Want to ensure your brain is functioning at its highest level? Make sure to get adequate protein. One study in the American Journal of Clinical Nutrition suggests that whey protein, in particular, may help increase serotonin function in people suffering from chronic stress. Whey protein powder supplementation increased memory and overall cognitive performance, suggesting that the amino acids in whey may improve brain function — especially if you’re stressed out. Healthy fats from nuts and coconut-derived MCT oil may also boost brain power. In one long-term population-based study, higher long-term nut intake was associated with better average cognitive health[*]. And MCT oil may also help with short-term cognitive function, especially in the elderly, and those with cognitive impairment[*]. Flavanol-rich dark chocolate may also to improve brain function by increasing blood flow to the brain and strengthening brain power and reducing risks of cognitive diseases and strokes[*][*]. These low-carb “peanut butter” balls may also benefit your heart. Whey protein may help improve blood pressure, lower triglycerides, and improve insulin sensitivity and blood sugar levels[*][*][*]. Dark chocolate is rich in flavonoids — antioxidants that may help improve coronary circulation, which is a key component of heart health[*]. These potent antioxidants may also help reduce blood pressure, improve blood circulation and flow and reduce the risk of heart disease[*][*][*]. 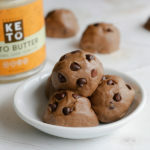 With almost no prep time and very little cleanup, these nutty keto fat bombs are perfect for busy days. Simply mix three-fourths cup Perfect Keto Nut Butter with three heaping scoops of Perfect Keto Chocolate Whey Protein Powder and mix until smooth. Fold in three tablespoons of chocolate chips, with an option of adding chopped nuts, seeds, or coconut flakes. Then, place the batter into the freezer for 15-20 or until it’s firm enough to roll into small “peanut butter” protein balls. Remove the batter from the freezer and line a baking sheet with parchment paper. Using your hands, roll the batter into small balls — approximately 16 at one tablespoon or so each — and place them on the baking sheet and into the fridge to set. For a variation on this classic chocolate peanut butter taste, replace the chocolate whey protein with vanilla protein powder and a splash of vanilla extract. You’ll be shocked at how both variations taste just like cookie dough, but with none of the sugar or carbs. Pro tip: You’re going to want to double or even triple this recipe. They’ll stay solid at room temperature, but make sure to store in the freezer or fridge. Add nut butter and whey into a small bowl. Mix well until smooth. Place in the freezer for 15-20 minutes until slightly firm. Divide and portion dough into small balls. Shape with hands and place on a baking sheet lined with parchment paper. Hi Kathy, nutrition facts is listed right after the recipe.